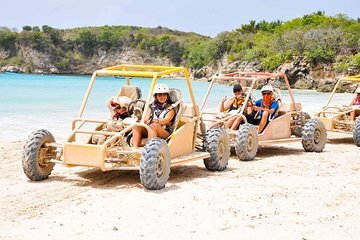 This Punta Cana buggy excursion takes you from the countryside to the coast, and lets you to drive your own buggy or ride as a passenger. Visit a rural plantation, learn about Dominican culture, and taste locally-grown coffee and cacao. Swim in a subterranean river and ride along one of the last resort-free stretches of coastline. Plus, choose from morning or afternoon departures to easily fit this tour into your schedule.